I guess Italian lemons do look like any other lemons! I seem to have rather a collection of photos of them, and these are mostly taken around the Amalfi Coast or Cinque Terre areas of Italy. Many of the shops have beautiful displays outside, just waiting for a quick photo to be snapped, and many of the restaurants have a simple heaped bowl of lemons sitting on a table before the restaurant is barely open in the morning. 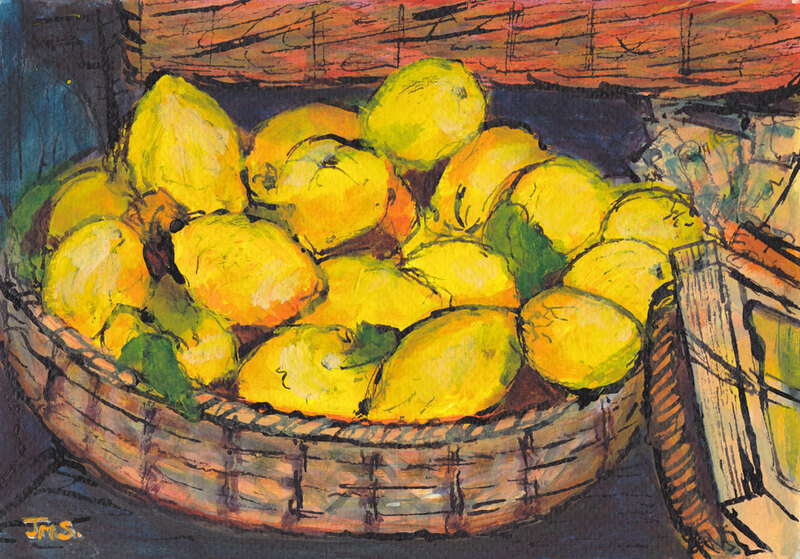 Then of course, speaking of lemons, there’s also the wonderful Lemoncello, an Italian lemon liqueur. This particular photo, was taken in Manarola, Cinque Terre on our visit there last year. If you would like to buy this painting, please click on this link to my Art Weekly Online Shop, or if you’d rather deal with me direct, please email me at jackie@jackiesherwood.com.